I knew a family once that had several mounted deer heads on their walls. At Christmas time, they would put a red clown nose on one of the trophies, which I though was rather clever. My kids didn't like it at all. Unfortunately, they moved away and I couldn't find any pictures of the idea on the internet. But I found plenty of other strange and wonderful holiday decorations that may tickle your funny bone. I've written before about how people in my neck of the woods make do with what they have. In this case, they had the reindeer, but no sleigh. However, they had a Volkswagen that did just fine. On the other hand, this homeowner had the sleigh, but no reindeer. I am aware that Santa's sleigh pulled by flamingos is a popular decoration in Florida and other tropical states, but this one is covered with snow! Sue Salah of Royal Oak, Michigan made quite a stir with a decoration that told a story of how dangerous it is to hang lights on a house. A more recent version of the hanging-lights-accident comes to your inbox with a story attached, but Snopes has thus far labeled its veracity as "undetermined". Lighted deer frames dot the subdivisions this time of year. A few pranksters move them into what we should delicately call "compromising positions" if they were human. This decoration was altered to depict another seasonal theme, hunting season. Since it appeared on the internet a few years ago, others have tried to copy or improve on it. With more or less success, depending on the reaction you are looking for. Making do with what you have goes for Christmas trees as well. Anything that can be stacked in an evergreen tree shape and lit can be called a Christmas tree. Beer bottles make a nice tree, especially from a distance. At least the color is right! Mountain Dew cans are also the right color. Beer kegs, on the other hand, require some suspension of disbelief. A traditional Advent calendar has 24 days. A case of beer has 24 cans. Coincidence? You decide. In this rooftop scene, Santa Claus is taking a rest stop during his rounds. The lights on this house may look like a general tangle at first, but look closer. They've strung lights in the shape the the Flying Spaghetti Monster! The FSM has also shown up in smaller light displays and even tree ornaments. When you get right down to it, simpler is better. 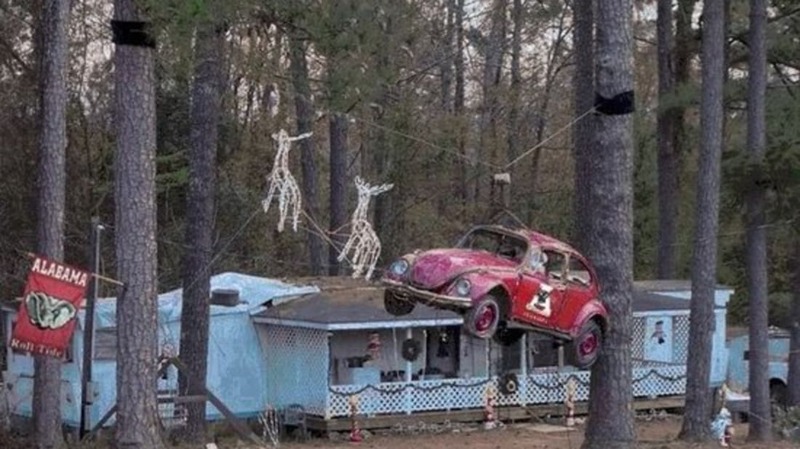 Your neighbors may spent days trying to out-decorate Clark Griswold, but what's important is that you make your good wishes for a Merry Christmas known to all who visit.